> ROCKET KITS>High Power Rockets>Rocket kit BullPuppy - Public Missiles Ltd.
Based on the U.S. Air Force"s Bull Pup missile, this kit is visually exciting on the ground as well as in flight! 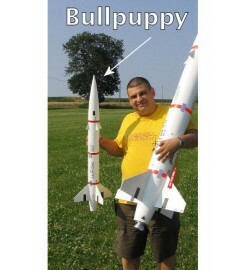 It"s perfect for beginners and experienced rocketeers alike. Don"t let the name fool you, this puppy is equipped with a 38mm motor mount and can be flown with 29mm motors using an optional 29 mm adapter. Though it is not mandatory, we recommend the use of PML 2-Part Expanding Foam (available on the Adhesives section) to aid in bonding the main fins to the boattail. Every Public Missiles Ltd. kit includes the exclusive piston ejection system which eliminates the use of wadding and greatly helps the parachute to come out. Motor retainer, motors, glue and paints are not included.